How good do you feel after giving your house a good clean from top to bottom? It looks sparkling, it smells fresh and you can relax with your feet up without getting distracted by smears on the windows or dirt on the floor. And, even better, a thorough spring – or autumn – clean could help to extend your life, which could leave you feeling even more smug after doing the housework. According to new research carried out by scientists from Canada’s McMaster University, the amount of exercise your body gets from a vigorous vacuuming or floor-scrubbing session could be enough to keep you healthy and make you live longer. But how exactly? The Canadian research found that exercising for 30 minutes five times a week can be enough to protect against heart disease and prevent premature death. This doesn’t have to mean going to the gym if that’s not your thing – you can get in a half-hour exercise session by ticking a household chore or two off your list. 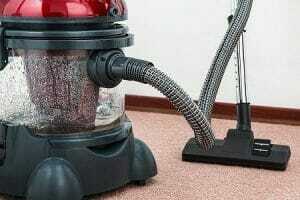 Dragging your vacuum around and lifting it up and down stairs provides your body with a pretty good workout. We know that some people hate cleaning – that’s why we offer our professional cleaning services – and might need to get their exercise in at the local park or at the gym. But for those that don’t mind housework, this is a great, simple way to increase activity levels and keep your body healthy for longer. Led by Scott Lear, the research team found that people who take part in 150 minutes (2.5 hours) of exercise each week have a 28 per cent reduced risk of premature death, while their risk of developing heart disease is around one-fifth lower than that of their inactive counterparts. Two-and-a-half hours is the amount of time that the World Health Organization (WHO) recommends adults aged between 18 and 64 spend exercising each week. The investigation concluded that eight per cent of deaths across the globe could be prevented over a seven-year period if this advice was followed. The study authors analysed and compared the benefits of different types of exercise, finding that running, swimming or gym sessions were not necessary to achieve these results, but that vigorous vacuuming could yield the same outcome. Even making small lifestyle changes like walking to work was found to have significant health benefits, with the researchers finding that people who walked briskly for 750 minutes (12.5 hours) each week were over one-third (36 per cent) less likely to die prematurely.